Achieving grand convergence in global health and bridging the gap between the countries, within country and between the states are important targets of ongoing SDGs. India is often described as a country with substantial progress in average health status alongside sizable geographical, rural–urban, social, economic and bio-demographic disparities. Although the country is witnessing a considerable improvement in health status across the states, alongside a steeper inter- and intra-state differentials in the speed of improvement coexist. Lack of equity with progress in the health status of the population in the laggard states of India is one of the key features in its growth story. 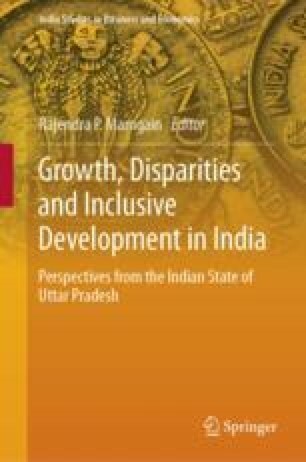 In this backdrop, the paper examines the hypothesis that whether the districts of Uttar Pradesh are converging towards a homogenous state or diverging and explores its determinants. We have used the data from Census 2001 and 2011 published by Registrar General of India (RGI) for estimation of district-wise life expectancy for all persons, males and females separately. Further, for assessing the determinants, we have used multiple data sources for various indicators which are considered as predictors of Life Expectancy at Birth (LEB) in the previous literature. We have estimated LEB at the district level for all persons, males and females for the year 2001 and 2011 using the well-known Brass method for indirect estimation of IMR, child mortality rate (CMR) and corresponding LEB of different model life table parameters. We have adopted novel approaches to the objective of testing of convergence hypothesis in average health status and health inequalities across the districts. The inequality measures range from absolute inequality measured through Dispersion Measure of Mortality (DMM) to relative inequality measured through Gini index. The convergence in health status was examined by using the standard parametric models (absolute β- and σ-convergences). Further, non-parametric econometric models (kernel density estimates) have also been used to detect the presence of convergence clubs, and finally we have analysed the determinant of convergence through panel regression model. Findings revealed that the inequality-based measures of convergence suggest that convergence process is underway regarding both absolute and relative inequalities in LEB across the districts, during 2001–2011. Similarly, the findings based on catching-up plots and absolute β-convergence and sigma convergence measures affirm the convergence across districts of Uttar Pradesh. The presence of a strong evidence of convergence clubs indicates that growth process is not inclusive and is skewed to few district clusters of the state. LEB growth process has favoured some districts compared to other. Further, findings of determinants of health status suggest that decrease in infant mortality, progress in income level, improvement in literacy rate, full immunisation of children and health infrastructure in laggard districts would help in convergence of the health status across the geographical space in the state of Uttar Pradesh. Achieving health goals of SDGs in Uttar Pradesh will not possible unless acceleration in the speed of the convergence is achieved with equity. The state should prioritise the agenda for reduction of IMR, a substantial increase in literacy rate and major investment in healthcare infrastructural availability and accessibility, universal access to immunisation services, especially in the laggard districts of the state. Global Health Observatory [GHO]. (2017). Monitoring health for SDGs. Retrieved June 15, 2017 from http://www.who.int/gho/en/. Hill, K. (2013). Indirect estimation of child mortality. In T. A. Moultrie, R. E. Dorrington, A. G. Hill, K. Hill, I. M. Timæus, & B. Zaba (Eds. ), Tools for demographic estimation. Paris: The International Union for the Scientific Study of Population. Retrieved June 30, 2017 from http://demographicestimation.iussp.org/content/indirect-estimation-child-mortality. Oxfam. (2017). Oxfam briefing paper—Executive summary. Retrieved June 15, 2017 from https://www.oxfam.org/sites/www.oxfam.org/files/file_attachments/bp-inclusive-growth-africa-020517-summ-en.pdf.